When you think about it we are all surrounded by clutter and distractions. It’s these distractions that can lead to longer lead-times, tighter deadlines and higher stress levels. Find out about some useful suggestions on how working with only the essentials, will help you be more happy and productive. A lot of people can be guilty of holding onto paperwork. Most of us are becoming better at keeping notes in the virtual realm, however paper is still seen as an essential. Handouts and meeting minutes are often printed out. Somehow paperwork seems to accumulate on desks, pilling higher and higher. Have a plan and sort it out. Decide what is for keeping, recycling and shredding. 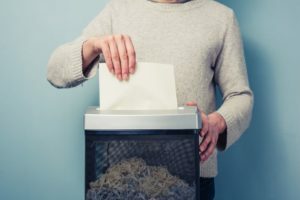 Any documents with important company or financial information should be shredded. Once organised, and down to the essential paperwork you need, make time to find it a home. Using folders and dividers are a great way to organise your desk. Folders themselves are best served if they are organised by priority and are within arm’s reach. View the wide range of folders ZenOffice provide here. Now you can actually see your desk for the first time in months, keep up with momentum. Ensure you only keep things on your desk that serve a purpose. Do you really need all those post-it notes or pens? No, well condense your list into a notebook and put away those pens into your desk tidy. A great way to declutter your desk is to think, have I used this in the past week? If the answer is no, you don’t need it to be within arm’s reach. Tidy things away into your desk drawers or letter tray, think of the saying ‘out of sight out of mind’. With less clutter on your desk you’ll really be able to concentrate and there will be fewer distractions. Check out our range of desktop accessories here. Now you’ve stripped your desk down to the bare essentials it’s time to give it a little personality. Try a lamp or potted plant. Plants produce fresh air from the photosynthesis process, which means if you are unlucky enough to not have a window they are a great alternative. Lamps help by bringing a bit of light into your office. To see our selection of desk lamps view them here. Through cutting out the clutter and distractions, the unnecessary processes and paperwork, you’ll save time and reduce your stress levels. Make a start today for a happier, healthier and more productive you! Declutter your workspace today with ZenOffice. For more information speak to our Account Managers.